(Paper) SBI Clerk Exam Paper - 2008 (Reasoning Ability) | BANK EXAM PORTAL : IBPS, SBI, PO, Clerk, IPPB, Bank Jobs Aspirants Community. 121. Four of the following five are alike in a certain way and so form a group. Which is the one that does not belong to that group? 122. Akshay is 16th from the left end in the row of boys and Vijay is 18th from the right end. Avinash is 11th from Akshay towards the right end and 3rd from Vijay towards the right end. How many boys are there in the row? 123. How many such pairs of letters are there in the word ''CHILDREN" each of which has as many letters between them in the word as there are between them in the English alphabet? 124. Pointing to the lady in the Photograph, Mrinalini said, ''Her son's father is the only son-in-law of my mother". How is Mrinalini related to the lady? 125. In a certain code 'MOTHER' is written as OMHURF. How will 'ANSWER' be written in that code? B, M, T, R, K, H and D are travelling in a train compartment with II-tier sleeper berth. Each of them has a different profession of Engineer, Doctor, Architect, Pharmacist, Lawyer, Journalist and Pathologist. They occupied two lower berths, three middle berths and two upper berths. B, the Engineer is not on the upper berth. The Architect is the only other person who occupies the same type of berth as that of B. M and H are not on the middle berth and their professions are Pathologist and Lawyer respectively. T is a Pharmacist, D is neither a Journalist nor an Architect. K occupies same type of berth as that of the Doctor. 126. What is D's profession? 127. Which of the following group occupies middle berth? 128. Which of the following combinations of person-berth-profession is correct? 129. Which of the following pairs occupy the lower berth? 130. Who is the Architect? 131. If it is possible to make a meaningful word with the third, the fifth, the seventh and the tenth letters of the word 'OUTRAGEOUS', which of the following will be the second letter of that word? It more than one such word can be formed, give 'X' as the answer and if no such word can be formed, give 'Y' as the answer. 132. The positions of the first and the second digits in the number 7986032451 are interchanged. Similarly the positions of the third and fourth digits are interchanged and so on. Which of the following will be the fifth digit from the right end after the rearrangement? 134. If the letters of the word ''PRINCE" rearranged as they appear in the English alphabet, the position of how many letters will remain unchanged after the rearrangement? 135. If 'A ★ B' means A is father of B', 'A × B' means 'A is mother of B' and 'A # B' means 'A is husband of B' then which of the following means 'P is grandson of Q'? 'P # Q' means 'P is neither smaller than nor greater than Q'. 'P % Q' means 'P is neither smaller than nor equal to Q'. 141. Four of the following five are alike in a certain way as regards their position in the above arrangement and so form a group. Which is the one that does not belong to that group? 142. What will come in the place of the question mark (?) in the following series based on the above arrangement? P R J # L 3 7 1 2 @ O N ? 143. If the above series is re-arranged in the reverse order, which will be the eleventh element to the left to the sixteenth element's from the left end? 144. How many such numbers are there in the above arrangement each of which is immediately preceded by a consonant and not immediately followed by a symbol? 145. How many such symbols are there in the above arrangement each of which is immediately preceded by a number and immediately followedby a consonant? Directions (151 - 155): Following is given a set of digits and the corresponding letter code of each digit followed by certain conditions for coding. In each question one number consisting six digits followed by four combinations of letter codes. You have to find out which of the combination of letter codes represents the set of digits based on the above codes and the conditions given below and mark your answer accordingly. Otherwise give answer (5), i.e. None of these. Conditions: (i) If both the first and the last digits of the number are odd digits then both are to be coded as I. 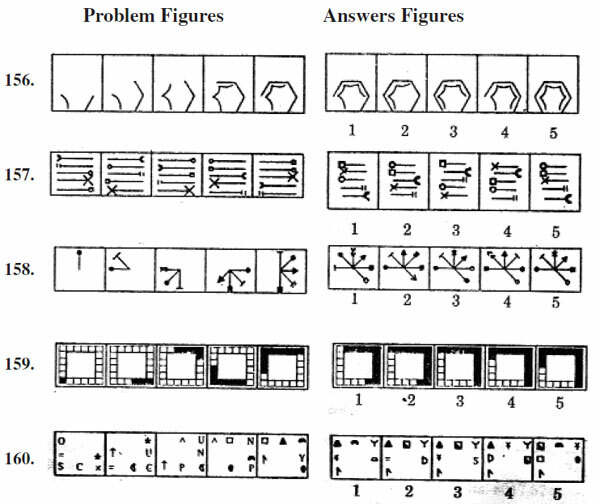 (ii) If both the first and last digits of the number are even digits then both are to be coded as Y.
Directionss (156 - 160): In each of the questions given below which one of the five answer figures should come after the problem figures, if the sequence were continued?